Emergency Physician David M. Larson, MD, is Head of the Ridgeview Emergency Departments at the Ridgeview Medical Center in Waconia and at Two Twelve Medical Center in Chaska, both located in Minnesota. Shedding Light talked with Dr. Larson about the demands of emergency care, his mission work, and how Enova surgical headlights help him on the job and in the field. Shedding Light: What makes emergency care different from other kinds of medical care? Dr. Larson: Every day is different from the one before. We see all ages and kinds of patients in the emergency room and in urgent care from minor conditions such as strep throat, ear infections and allergies to life-threatening conditions like heart attacks, orthopaedic injuries, and major bleeding from wounds. We diagnose and treat on the spot. Some patients are transferred to the hospital for further care and others are discharged with treatment instructions. Shedding Light: What is the scope of your practice at Ridgeview? Dr. Larson: Ridgeview has two emergency departments. One is at the Ridgeview Medical Center in Waconia, Minnesota, and the other is at Two Twelve Medical Center in Chaska, Minnesota. I oversee both departments. We see approximately 50,000 patients in the emergency room each year; about 20,000 at the Waconia location and 30,000 at the Two Twelve location, which is only three years old. The Two Twelve Medical Center also has 24/7 urgent care available. Both locations are supported by on-site diagnostic imaging, trauma bays, a helicopter pad and critical care specialists. Shedding Light: How has technology improved care in the emergency room? Dr. Larson: Technology has had a huge impact on how quickly we can assist patients in the emergency room. Some that come to mind are electronic medical records, accessible databases of information, diagnostic equipment such as the bedside ultrasound, and of course, imaging technology such as MRI and CT scans are all advances that have improved how we care for patients in the emergency room. Shedding Light: How do you use a surgical headlight in the emergency room? Dr. Larson: Using a headlight is becoming standard in emergency care. We often perform laceration repair as well as minor surgeries. The headlight needs to provide excellent illumination and have an adjustable light spot to focus on small cavities. We often go from room to room, which makes a portable headlight preferable. Shedding Light: When did you first begin using an Enova LED surgical headlight? 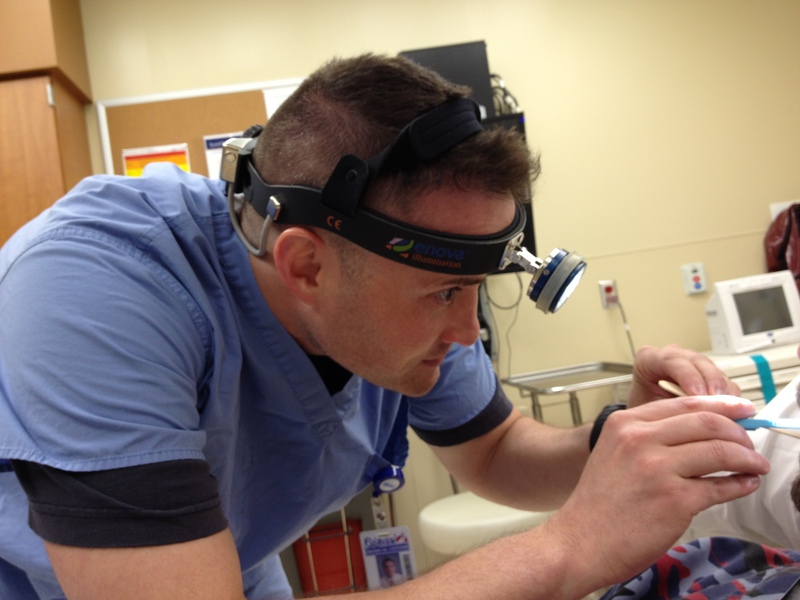 ER Physician using an Enova LED surgical headlight. Dr. Larson: I was one of the first users in 2005 when the Halo 5000 came out. Today we use the Iris S-100. Before purchasing an Enova headlight, we would use the OR’s fiber optic light but it wasn’t always readily available and it’s tethered to a stand so it’s not as portable as I’d like. Shedding Light: What kind of mission work do you do? Dr. Larson: For the past four years I’ve traveled to Haiti with a team of general surgeons as part of a group mission. 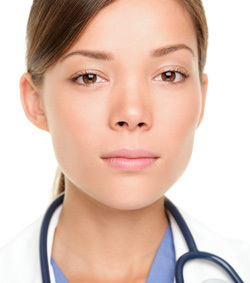 We perform general elective and gynecological surgeries such as hysterectomies and hernia surgeries. I usually bring my headlight and Enova has donated a headlight as part of their mission program. Dr. Larson: The emergency room is available 24/7 and we use the Iris S-100 every day. Shedding Light: Do you recommend the Enova LED surgical headlight to your colleagues? Dr. Larson: Yes. Now that I’ve used both the Halo and the S-100, I recommend the S-100 over the Halo. * It is extremely portable and easy to use. The light is superior and the battery pack is easily rechargeable for continued use. As I said earlier, the surgical headlight is becoming standard in emergency care and the Enova LED headlight is my headlight of choice. *Note: Enova Illumination no longer manufactures the Halo headlight. Enova understands the financial dilemma faced by residents. That’s why we offer the Enova Residents Program. Residents who are still in their residency or who have graduated within the last three months may purchase new or used Enova LED surgical headlight systems in excellent condition for up to 40% off list prices. Purchase more than three headlights at one time to receive an additional 5% discount. Each Enova LED surgical headlight system includes the LED surgical headlight, a digital battery pack, a charger, accessories, and a carrying case. All Enova headlights come with a 30-day money-back guarantee. If the headlight doesn’t meet your needs, return it for a refund. Plus, any resident purchasing one of Enova’s new, current LED surgical headlight model, will receive an additional B2X digital battery FREE—a $200 value with a one-year warranty. Enova offers a no-interest installment payment plan of three monthly payments with a 50% down payment. We accept VISA and MasterCard; your credit card will be charged for the down payment before shipment and then monthly until the balance is paid in full.